The ShuttlePix P-400Rv Digital Microscope from Nikon Metrology is a portable digital microscope that has a sleek, compact design well suited for onsite use. This new concept in digital microscopy allows for much simpler remote inspection of large samples that previously had been too challenging. Operators can use the ShuttlePix for inspection, observation, simple measurement and recording of high-resolution images in industrial applications, as well as other practical imaging applications where an object needs to be inspected on site and in its correct position without risk of damage. 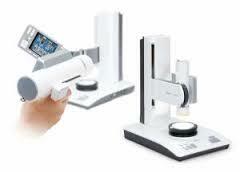 The unique design of the ShuttlePix allows the removal of the microscope head from the Motorized Focusing Stand controller providing the possibility to capture images under different conditions with cordless operation. By adapting the ShuttlePix P-400Rv onto the Motorized Focusing Stand Controller, and in combination with the 17″ touch panel monitor, image capture is easy and effective. The microscope is very easy to operate. Just by holding down the capture button, a “best-shot selector” automatically starts up and saves only the best shot from a string of continuously shot images. There is also automatic selection of optimal camera mode based on the sample. Previous experience with using a microscope is not necessary, since the ShuttlePix operates in a similar fashion as a compact digital camera. An LED illuminator is integrated with the ShuttlePix P-400Rv in a compact body with 20x optical zoom lens. It is capable of observing a wide range of magnifications between 20x-400x* without the need to change a lens. A motorized focusing stand controller accompanies the ShuttlePix in combination with a 17-inch touch screen monitor that has motorized Z focusing, simple measurement analysis, extended depth of focus (EDF) and three types of stage options for a multitude of applications. Its application software offers 3-D image reconstruction and measurement. Image capture for large samples (up to 75mm x 50mm x 148mm) is possible with the Zoom Camera Head and with the Motorized Focusing Stand. Select from three dedicated Stages matched to the observation subject. When using with a PC, ShuttlePix Editor software enables you to take simple measurements of the sample object, display EDF images in cross-section or 3D, and export measurement data to Excel. Add comments and markers to key measurements such as distance, angle, and area. Measurement results can be output in tabular form.